This 20 oz. EXOCORE Camper's Hatchet is part of the line of axes launched by DEWALTdesigned to withstand harsh forestry environments and to make the user's job easier. With a hollow, light-weight handle, swings are quicker and more balanced for deeper, easier cuts. Scalloped cutting edges easily cut into wood and release from material. These have our Carbon Fibre Composite overstrike to protect the most vulnerable part of the tool. The 7 Diagonal cutting plier, has laser hardened cutting edges to provide longer cutting life. Only Channellock uses knife and anvil style cutting edges for perfect mating and superior longevity. A special electronic coating on the polished high carbon drop forged steel prevents rusting. Channellock Blue(r) comfort grips give you maximum comfort. When you're hitting the great outdoors, make sure to bring the Estwing's 14-inch sportsman's axe. It is ideal for campers and outdoorsman. 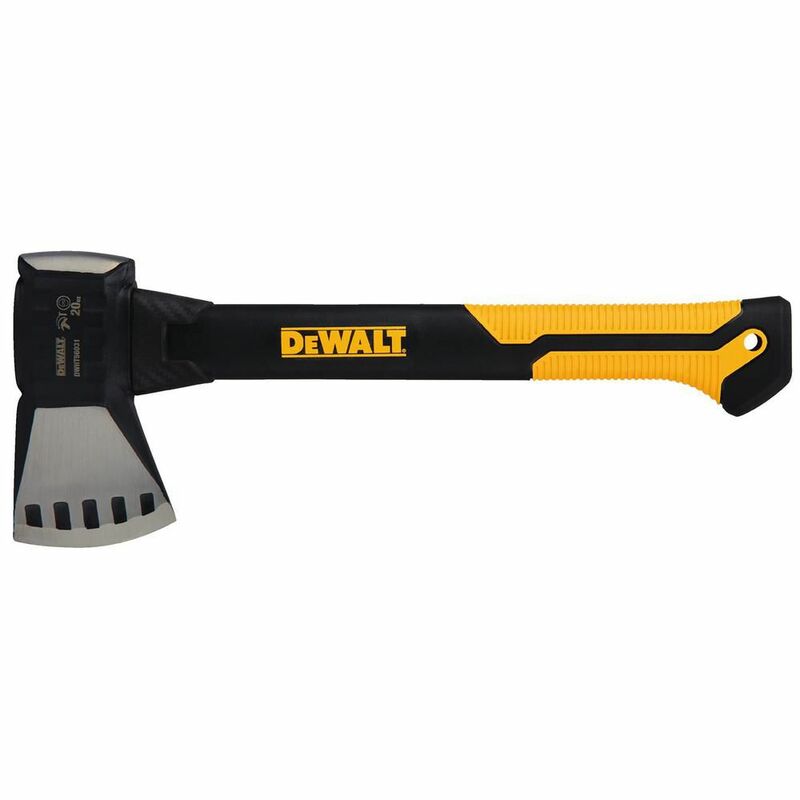 It features a head and handle of the axe are forged in 1-piece and are fully polished. This classic axe offers unsurpassed balance an attractive sheath. It has a tempered thin 3-1/4-inch cutting edge for easy cutting. It has a genuine leather grip that is sanded and lacquered for a beautiful finish. Always make sure to wear safety goggles to protect your eyes when in use. To develop our pick, we combined the studies of ergonomics and human factors with the best materials and robust industrial design. The result is a rugged, powerful tool that helps you break up hard surfaces and dig in hard soil while reducing muscle fatigue and joint pain. We start with premium steel forged into a perfectly balanced design to make every swing your best. 20 oz. EXOCORE Camper's Hatchet This 20 oz. EXOCORE Camper's Hatchet is part of the line of axes launched by DEWALTdesigned to withstand harsh forestry environments and to make the user's job easier. With a hollow, light-weight handle, swings are quicker and more balanced for deeper, easier cuts. Scalloped cutting edges easily cut into wood and release from material. These have our Carbon Fibre Composite overstrike to protect the most vulnerable part of the tool. 20 oz. EXOCORE Camper's Hatchet is rated 4.8 out of 5 by 10. Rated 5 out of 5 by John from It is lightweight sturdy handle and strong blade. Love it!... It is lightweight sturdy handle and strong blade. Love it! Rated 5 out of 5 by Micheal from This is just the right weight to carry on my... This is just the right weight to carry on my SxS. Rated 5 out of 5 by Jeff from Great weight distribution. Good size for easily keeping in toolbox.... Great weight distribution. Good size for easily keeping in toolbox. Had no problem when using it. Rated 5 out of 5 by Lynn from I purchased this hatchet as a gift. My husband likes... I purchased this hatchet as a gift. My husband likes the design, weight and grip of it. His plan is to take it camping. He really likes it. Rated 5 out of 5 by DocOC from Great product. Took it right out to split some... Great product. Took it right out to split some kindling. Only suggestion would be a safety case.